“Triple E,” or EEE, is a mosquito spread virus that is spread to animals — most often to horses — and also to humans by infected mosquitoes. In horses, EEE causes inflammation or swelling of the brain and spinal cord, and in 70 to 95 percent of all cases, the disease is fatal. As of late July, the Florida Department of Agriculture and Consumer Services had reported 44 cases of EEE statewide for 2018, with two cases in Polk County. To view an interactive map of EEE cases by county, see the QR code. For state health and agriculture officials, and well as for horse owners and veterinarians, that is an alarming number, considering that Florida had just six cases of the virus for all of 2017. For the entire nation, only 86 cases of EEE were documented last year, according to the U.S. Department of Agriculture. Mosquitoes become infected with the EEE virus when they feed on infected birds, which circulate high levels of the virus in their blood. Infected mosquitoes then transmit the virus to animals and humans while biting. In horses, general symptoms of EEE are neurological which can include head pressing, convulsions, lack of response to facial stimulation, propulsive walking, aggressiveness, hyperexcitability, a fever above 103 F, ataxia, paralysis, anorexia, depression, and stupor. There is no “cure” for an infected horse, only supportive care. As a viral disease, antibiotics are ineffective against it, and no antiviral drugs are available for treatment. The best protection for your horse against EEE is making sure it is up to date on its vaccinations. Every horse should be vaccinated annually or semi-annually against West Nile virus, rabies, tetanus, and eastern/western equine encephalitis. Talk regularly with your veterinarian about your horse’s vaccination needs and schedule. This column is sponsored by Polk Equine, and the opinions expressed herein may not reflect those of CFAN or of its advertisers. 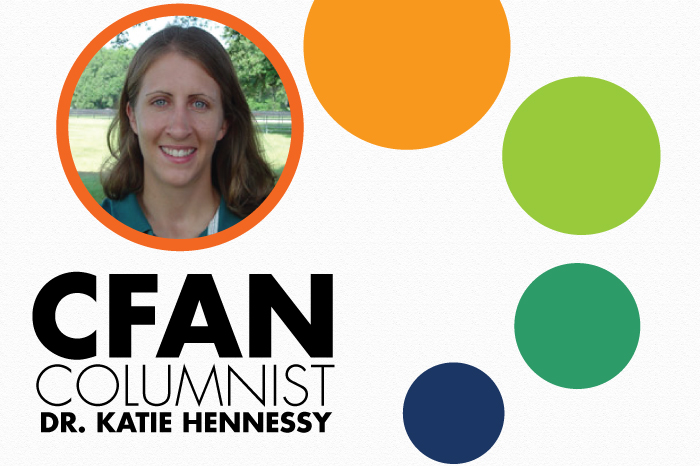 BIO: Dr. Katie Hennessy graduated from the University of Illinois College of Veterinary Medicine in 2008 with a degree in large animal health and equine medicine. She completed an advanced internship at The Equine Medical Center of Ocala and is currently the owner and practicing veterinarian at Polk Equine. Her expertise ranges from small and exotic creatures to large animals, specializing in equine medicine.